Imperfectly Painted: New Maya Cosmetic Polishes! I have some new Maya Cosmetics polishes to share with you today! 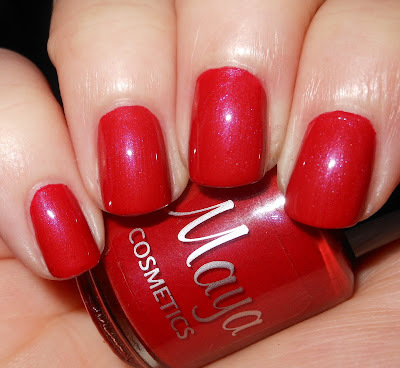 I posted a review of some previous Maya Cosmetics polishes in November. If you'd like to see that post you can find them here. All the polishes I am showing you today are available in the shop now! The following polishes are part of the Crescent City collection. All of these polishes will be limited edition with the exception of Treme which I reviewed in my November post. Big Chief is a bright blue jelly base with silver micro glitter, hot pink, orange, and yellow glitter. I really love the bright blue jelly base on this polish. The formula on this was so smooth and easy to work with. I used 3 coats. A great application with a jelly glitter polish always makes me happy. I would recommend you let this bottle sit upside down for a minute or two to let the glitters disperse better in the polish. This is a very workable polish though, so you really do not need to let it sit upside down for more than a minute! 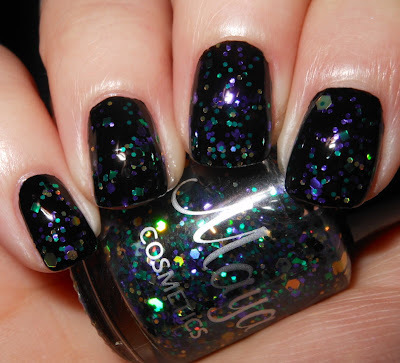 Let the Good Times Roll is a mixture of gold holo, purple, green and black glitters in a clear base. I used 2 coats with this one. This is a great combination of colors that is clearly perfect for Mardi Gras. I love the varied glitter sizes. Cookin' Creole is a mixture of pink shimmer, green, brown, pink, and white glitters in a light brown jelly base. This is really a unique polish. I was really impressed with the jelly formula with this. I used 3 coats here that applied evenly and smoothly. The pink shimmer is a really nice unexpected addition to this polish. I will say, this is probably not the best color on my skin tone, but I bet it would look great on a many others! These next two polishes will be permanent polishes with Maya Cosmetics. Grayscale is a mixture of gunmetal, white, and black small and micro glitters in a clear base. Hello and welcome to amazing! This polish is awesome! I used 2 coats here, so it can really build up nicely. I added top coat to this, but on its own it definitely resembles the "Liquid Sand" texture we are seeing that is on trend now. I really absolutely adore this so much that I cannot think of anything else I could add. For Michelle is a muted rosy red with a subtle pink and silver shimmer. This is not your standard red. This red has this slight muted quality that takes it away from the traditional reds you see. The pink shimmer throughout is a beautiful and unexpected touch. This applied really well, and this is nice transition from your typical glitter bomb indies. All the profits from the sales of For Michelle will be divided between the Wounded Warriors Project and the Fisher House Foundation. If you'd like to read the story behind For Michelle, you can find it here. You can purchase these polishes for $8.00 on the Maya Cosmetics website (I will warn you prices will be raised to $9.50 for all polishes effective Feb 1st, so this would be good time to buy!). I am again very impressed with Maya Cosmetics. What really stands out to me with these polishes is the formulation. They are well made and so easy to use. I'm not a fan of having to work with my polish to make it look right, but Maya Cosmetics polishes are effortless! You can purchase Maya Cosmetics on their website. Follow Maya Cosmetics on Facebook and Twitter. Keep up to date with Maya Cosmetics on their news blog. *I received these products for my honest review by Maya Cosmetics. I looove Cookin' Creole & The Gray One! Ohh I love Big Chief. That's so fun! These are really pretty! I love Grayscale!